THERE are plans for the world's tallest vertical lift bridge over the Thames in London. 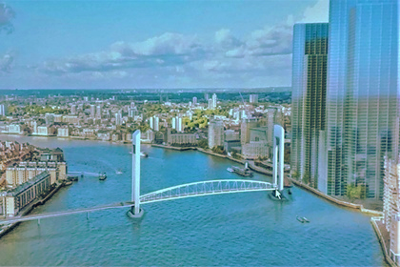 Transport for London have revealed plans for a 90 metres tall vertical lift bridge with a span of 180 metres to connect Rotherhithe with Canary Wharf in South East London, Roger Fox tells us. This will be a pedestrian and cycling bridge with its deck lifting to a height of 60 metres making it both the longest and tallest vertical lift bridge in the world, if eventually built. The deck will be eight metres wide and 180 metres long, it being 12 metres above high tide, with Roger remarking that he doesn't think that narrowboats would have an air draught problem with this one!